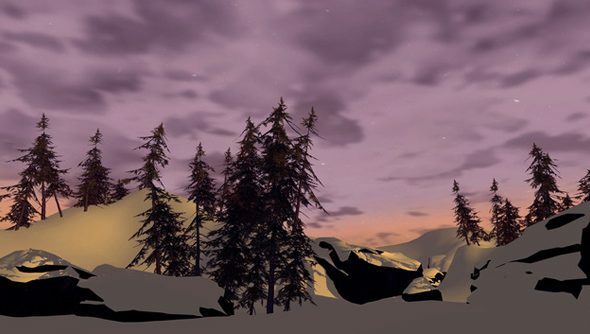 For a while there it looked like The Long Dark would never return from the wilds of Kickstarter – an accidental Captain Oates in the face of crowdfunding (or perhaps just wallet) fatigue. But enough backers have now claimed a future copy of the survivalism sim to guarantee that it won’t itself be claimed by gangrene or frostbite. Hinterland hit their $200,000 CAD goal over the weekend – and the game has its sights set on higher peaks. In a welcome change from what’s seemingly become the Kickstarter norm, Hinterland decided not to divvy their platform support between stretch goals – so we’re already guaranteed versions of The Long Dark on PC, Mac, Linux and even the Oculus Rift. Despite that smorgasbord of support, however, the developers are hoping there’s enough untapped enthusiasm in the anonymous Crowd yet to raise another $25,000 CAD, or even $50,000. While less than three days remain on their Kickstarter clock, Hinterland are ready to launch a Paypal page – donations from which will be tallied alongside the Kickstarter funds when taking stretch goals into account. At $25k, they’ll put together a downloadable graphic novel to be doled out to backers at all tiers. And at $50k, an extended soundtrack: in Hinterland’s words, “double the music!”. The Long Dark’s composers are named Cris and Sascha, and are veterans of Mass Effect 3, Borderlands, Space Marine and Tron – though not the movie bits that Daft Punk did, obvs. They’ve been working on a musical mirror of protagonist Mackenzie’s “loneliness and rather desperate situation”. Their key inspiration? John Carpenter’s The Thing. “Of course in The Long Dark we don’t have an Alien lifeform buried underneath the ice [Boooo! – Ed] but some similarities are still to be made: the cold winter, the isolation, and sheer need to survive,” said the pair in an update. In The Long Dark, North America’s technology infrastructure is kaput, leaving its residents to salvage older, mechanical means of survival. In kind, the composers have set about sourcing ancient Moogs from English universities, and put together a homemade instrument built “mostly with parts to be found on a scrap yard”. We talked through The Long Dark with Hinterland founder and Far Cry 3 storyteller Raphael van Lierop. It sounds dead good, doesn’t it?